With many of us leading increasingly stressful jobs and busy lifestyles, it is now more important than ever to make sure we take time out to relax and recharge our batteries. Many people who want to soothe away their stresses opt for a weekend away at a spa, although these breaks can be very expensive. However, it’s not too difficult to bring the spa to your own home- and you can create a peaceful and relaxing environment with ease. Invest in some scented candles and place them around the bathroom, and make sure you have your favourite magazine or book to hand. Recreate the spa experience by investing in some top quality products that will get you well on the way to the ultimate relaxation. 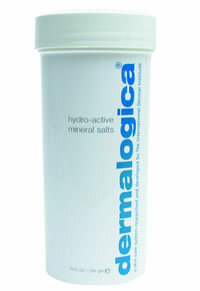 Dermalogica Hydro-Active Mineral Salts are fantastic for soaking away the day’s stresses, and a combination of essential and purifying oils makes it the perfect way to really unwind. Another fab stress buster is Dermalogica Stress Relief Treatment Oil, which can be added to your bath to help you forget your troubles. Treat yourself to a relaxing spa- style soak and refresh your mind and your body.